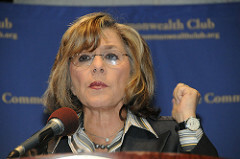 Six different Senate committees are writing pieces of the climate and energy bill, ultimately leaving it to Democratic leadership to resolve differences, Boxer said, noting that she expects panels to overlap in certain areas. “I think all the committees will put in their opinion on the areas where they think they have some jurisdiction, and then Senator [Harry] Reid will take what he feels are the best parts of the bill,” she said. Other committees with a stake in the climate bill are Agriculture, Energy and Natural Resources, Finance, and Foreign Relations. The Agriculture and Foreign Relations panels have yet to signal for sure whether they will offer language through a formal markup. Energy and Natural Resources Chairman Jeff Bingaman (D-N.M.) has already passed legislation that includes a nationwide renewable electricity standard and a raft of other energy incentives, including a provision that could bring oil and gas rigs closer to Florida’s Gulf Coast. Finance Chairman Max Baucus (D-Mont.) said last week that he plans to mark up sections of the bill dealing with emission allowances and international trade. Reid (D-Nev.), the Senate’s majority leader, has set a Sept. 28 deadline for the committees to complete any legislation. Further down in the report, Ben Nelson is hemming and hawing about the cap-and-trade portions: "They’re talking about the right thing when they recognize that anything that increases utility rates has to be looked at to see if there’s a way to avoid that result. I think that's the right subject. I don't know if they can accomplish their objective." Sounds iffy. Joe Romm notes that Nelson will likely vote against any big climate legislation, so his caviling doesn't matter much. I'm not sure about that. Nelson may be not vote for the final bill, but Democrats mainly need to worry about whether he'll help the Republicans filibuster or not. And that's still up in the air.